Although it is now one of the world’s great icons of freedom, the Liberty Bell wasn’t always a symbolic force. Originally used to call the Pennsylvania Assembly to meetings, the Bell was soon adopted not only by abolitionists and suffragists but also by civil rights advocates, Native Americans, immigrants, war protestors, and so many other groups as their symbol. Each year, two million people journey to the Bell just to look at it and ponder its meaning. The bell now called the Liberty Bell was cast in the Whitechapel Foundry in the East End of London and sent to the building currently known as Independence Hall, then the Pennsylvania State House, in 1752. It was an impressive looking object, 12 feet in circumference around the lip with a 44-pound clapper. Inscribed at the top was part of a Biblical verse from Leviticus, "Proclaim Liberty throughout all the Land unto all the Inhabitants thereof." Unfortunately, the clapper cracked the bell on its first use. A couple of local artisans, John Pass and John Stow, recast the bell twice, once adding more copper to make it less brittle and then adding silver to sweeten its tone. No one was quite satisfied, but it was put in the tower of the State House anyway. From 1753 until 1777, the bell, despite its crack, rang mostly to call the Pennsylvania Assembly to order. But by the 1770s, the bell tower had started rotting and some felt ringing the bell might cause the tower to topple. Thus, the bell was probably not rung at all to announce the signing of the Declaration of Independence, or even to call people to hear its first public reading on July 8, 1776. 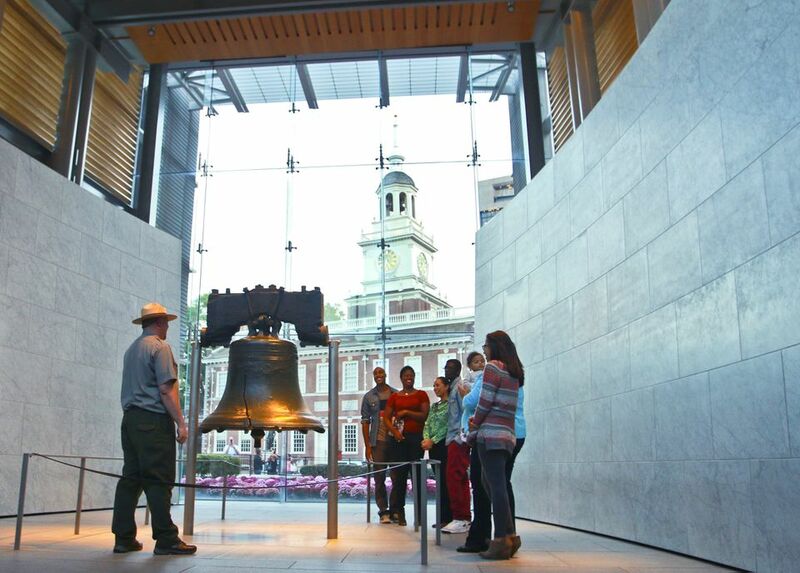 Still, officials considered it valuable enough to move, with 22 other large Philadelphia bells, to Allentown in September 1777, so that invading British forces would not confiscate it. It was returned to the State House in June 1778. While it remains unknown what exactly caused the first crack in the Liberty Bell, presumably every subsequent use caused further damage. In February 1846, repairmen attempted to fix the bell with the stop drilling method, a technique in which the edges of a crack are filed down to prevent them from rubbing against one another and then joined by rivets. Unfortunately, in a subsequent ringing for Washington’s Birthday later that month, the upper end of the crack grew and officials resolved to never ring the bell again. By that time, though, it had hung around long enough to gain a reputation. Because of its inscription, abolitionists started using it as a symbol, first calling it the Liberty Bell in the Anti-Slavery Record in the mid-1830s. By 1838, enough abolitionist literature had been distributed that people stopped calling it the State House bell and forever made it the Liberty Bell. Once it was no longer used as a working bell, especially in the years after the Civil War, the Liberty Bell's symbolic position strengthened. It started going on what were essentially barnstorming patriotic trips, mostly to World's Fairs and similar international expositions where the United States wanted to show off its best wares and celebrate its national identity. The first trip was in January 1885, on a special railroad flatcar, making 14 stops along the way to the World's Industrial and Cotton Centennial Exposition in New Orleans. Following that, it went to the World's Columbian Exposition—otherwise known as the Chicago World's Fair—in 1893, where John Philip Sousa composed "The Liberty Bell March" for the occasion. In 1895, the Liberty Bell made 40 celebratory stops along the way to the Cotton State and International Exposition in Atlanta, and in 1903, it made 49 stops en route to Charlestown, Massachusetts, for the 128th anniversary of the Battle of Bunker Hill. This periodic Liberty Bell road show continued until 1915, when the bell took an extended trip across the country, first to the Panama-Pacific International Exposition in San Francisco, and then, in the fall, down to another such fair in San Diego. When it came back to Philadelphia, it was put back inside the first floor of Independence Hall for another 60 years, during which time it was only moved once around Philadelphia to promote War Bond sales during World War I. But, again, a group of activists were eager to use the Liberty Bell as its symbol. Women suffragists, fighting for the right to vote, put the Liberty Bell on placards and other collateral materials to promote their mission of making voting in America legal for women. After World War I, the Liberty Bell stood primarily in the Tower lobby of Independence Hall, the climax of visitor tours to the building. But city fathers worried that the celebration of the bicentennial of the Declaration of Independence in 1976 would bring undue stresses of crowds to Independence Hall and, consequently, the Liberty Bell. To meet this impending challenge, they decided to build a glassed-in pavilion for the Bell across Chestnut Street from Independence Hall. On the extremely rainy early morning hours of January 1, 1976, workers trundled the Liberty Bell across the street, where it has hung until the construction of the new Liberty Bell Center in 2003. On October 9, 2003, the Liberty Bell moved to its new home, a larger center with an interpretive exhibit on the Bell's significance over time. A large window allows visitors to see it against the backdrop of its old home, Independence Hall. Visit Philadelphia is a non-profit organization dedicated to generating awareness of and visitation to Philadelphia, Bucks, Chester, Delaware and Montgomery counties. For more information about travel to Philadelphia and to see the Liberty Bell, call the new Independence Visitor Center, located in Independence National Historical Park, at (800) 537-7676.